TeamViewer used to top our list of the best free remote access programs. However, many users have reported that the software, while free for personal use only, falsely identifies that they're using it for commercial use and demands payment. You might not have that experience, but if you do, please consider using a TeamViewer alternative like Remote Utilities or Chrome Remote Desktop. Below is our review of TeamViewer as of version 13. TeamViewer is one of our favorite free remote access programs. It's filled with features you don't normally find in similar products, is very easy to use, and works on pretty much any device. You can download and use TeamViewer on a Windows, Mac, Linux, or mobile device. 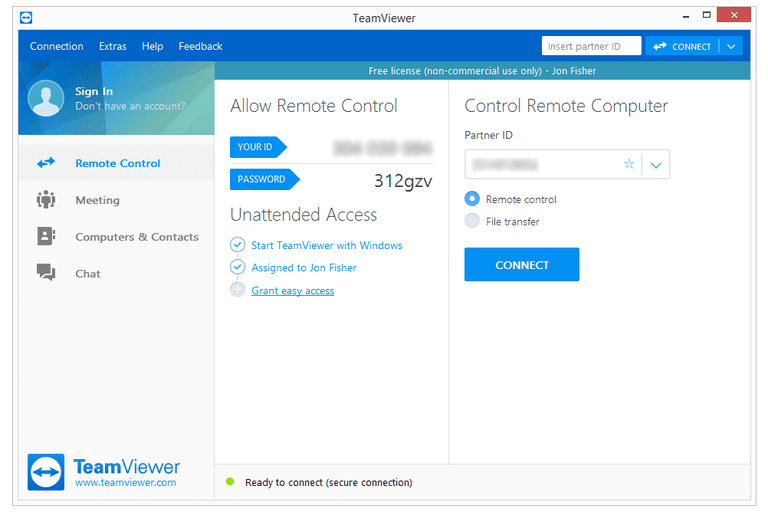 Read on for more on all the details about TeamViewer, what I think about the program, and a quick tutorial on how it works. TeamViewer has a couple different downloads you can use to access a remote computer, but they both work nearly the same. You would choose one over the other based on your needs. Each TeamViewer install will give out a unique 9 digit ID number that's tied to that computer. It actually never changes even if you update or reinstall TeamViewer. It's this ID number you'll share with another TeamViewer user so they can access your computer. Although this ID number is supposed to never change, some users have reported that there's did, in fact, become an entirely new number randomly. If you plan on relying on TeamViewer as your only remote access program, you might consider installing another tool on the side just in case you have to find your ID number while away from your computer. All-In-One is the name of the full version of TeamViewer. It's absolutely free and is the program you need to install if you wish to set up a computer for constant remote access so you can always make a connection when you're away from it, otherwise known as unattended access. You can log into your TeamViewer account in the All-In-One program so you can easily keep track of the remote computers you have access to. For instant, spontaneous support, you can use the program called QuickSupport. This version of TeamViewer is portable, so you can run it quickly and immediately capture the ID number so you can share it with someone else. If you're helping out a friend or family member, the easiest solution would be for them to install the QuickSupport program. When they launch it, they'll be shown an ID number and password that they must share with you. You can connect to the QuickSupport computer with either the All-In-One program or the QuickSupport version—they both allow remote connections to be established. So you can actually both install the portable version and still make a solid connection with each other, which would result in the quickest method of remote access for both parties. If you're looking to set up unattended access to connect to your own computer when away, you just need to setup a master password in TeamViewer that never changes. Once that's completed, you just have to sign on to your account from a browser, mobile device, or computer with TeamViewer installed to make the connection. TeamViewer is by far my favorite remote desktop software. The QuickSupport version is so simple and easy to use, it's always my first suggestion when providing remote support to anyone, and it's one of the only remote access programs that lets you remotely view the screen of an iPhone or iPad. The fact that TeamViewer doesn't require you to set up port forwards is a solid plus because most people won't want to go to the hassle to configure router changes to accept remote connections. On top of that, all that has to be shared is the ID and password that's clearly seen when you first open the program, so it's rather simple for everyone to use. If you're looking to always have access to your own computer from afar, TeamViewer doesn't fall short with this demand either. You can setup TeamViewer so you can always make a connection to it, which is wonderful if you need to exchange files or view a program on your computer when away from it. One thing I don't like all that much about TeamViewer is that the browser version is difficult to use. It's quite possible to connect to another computer through a browser with TeamViewer, but it's just not as effortless as the desktop version. However, I can hardly complain because there is a desktop version available and it is easy to use. Something else about TeamViewer that seems to stop most people from using it is that it might suspect that you're using the program for commercial reasons even when you're not, and will thus stop working until you pay for it. The only other solution you have if that happens is to fill out this Personal Use Verification form. As mentioned above, another odd glitch in this program is that it might one day change your ID number, making it impossible to access your computer remotely unless you know the updated number. This is probably a rare occurrence, but one you should be aware of.